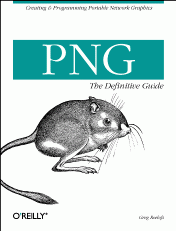 PNG (Portable Network Graphics) is the next-generation graphics file format for the Web. Designed as an open-source format to replace the proprietary GIF format, PNG is better, smaller, more extensible, and free. Already supported by major software like Macromedia Fireworks, Adobe Photoshop, and Microsoft Office, as well as Netscape Navigator and Microsoft Internet Explorer, PNG is an elegant and feature-rich image format that has finally achieved broad industry support. PNG: The Definitive Guide addresses the needs of both graphic designers who want to get the most out of the format and programmers who want to add full PNG support to their own applications. Greg Roelofs is a senior researcher at Philips Electronics, specializing in compression, graphics, 3D, and audio software. He helped design the PNG image format, maintains its official web site, and writes free software in his spare time. Greg holds a doctorate in astrophysics from the University of Chicago.